Most of us know Steve “Woz” Wozniak as the guy who took advantage of the NTSC color burst signal as a way to get cheap color computer graphics. Oh, also, he founded Apple. 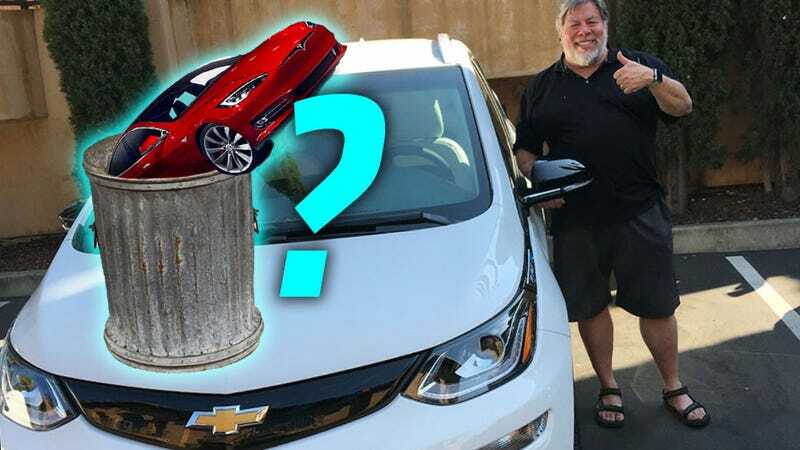 Woz has been a very visible owner of a Tesla Model S, but it now looks like he’s considering switching to a Chevy Bolt, according to his Facebook page. I expect to be switching cars soon! This is a big deal (well, to a certain class of geek, at least) because both Woz and Tesla founder Elon Musk made a pretty big deal out of Woz’ purchase of a Tesla Model S in 2013. Musk first chided Wozniak for getting a “gas guzzler” instead, and then publically thanked Wozniak when he finally did buy a Tesla. Since then, Woz has written about his personal experiences with his Tesla, and heaped very Silicon Valley-specific praise on the company. It gets down to my product ideas of balance and getting the most from the least. Try to make things simple and affordable but very adequate. This car hits my sweet spot but I won’t give it an A+ until I have one and drive it a while. Gary, after seeing the insides and the UI, Tesla will have a difficult time selling me a Model 3. A lot of things wrong with the Tesla model S are done correctly (my opinion) in this car. But it’s still missing a place to put your sunglasses, ha ha. Really? I thought everything had a place for sunglasses now. Even the new Smart has that. Knowing myself, it may replace the Tesla. A lot of complaints about the Tesla that my wife and I have are solved in this car. It’s not just some name where you have to take a side. The user conveniences are well thought out and the functionality is great. I tell everyone that the most valuable, useful car of my life was the Prius that I drove for 10 years. I don’t need top-of-the-line luxury. We have a Tesla but there is no other EV choice that’s good for road trips. The Bolt will need some personal testing by Janet and myself to find out how it is on road trips. Otherwise, it’s what we want. Extra features aren’t the big picture, or we’d have skipped the Tesla for a Mercedes. This makes sense to me, from what I know about Wozniak. He’s more of a traditional, old-school geek, and less taken by the style and luxury of a Tesla. The Bolt’s expected range, around 200 miles, is in the same ballpark as the Tesla, but GM does not yet have the rapid-DC charging network of Tesla, so if Woz wants to take a bunch of car trips, he should consider his options, like a small nuclear reactor he tows behind him.